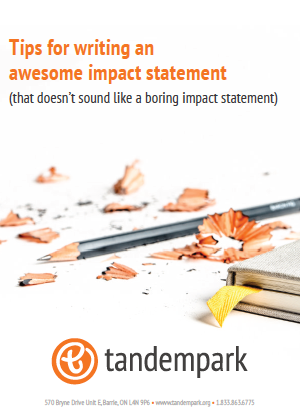 Why create an Impact Statement? Opens the door for further conversation. Identifies the pain/problem you are tackling. Positions your role in solving the problem. Presents an opportunity for the audience to see their role in your mission. Invites the audience to join your crusade. We call it an Impact Statement. Others call it a One-Liner. No matter what the label, it’s a quick response that, if crafted and delivered well, will be the start of a conversation where you get to talk about the thing that gets you really excited! Having put it to the test ourselves (see tip #4), we’re happy to share some of the things we’ve learned along the way. Awesome! Please check your email to access your copy of this e-book.